Why is it important to learn how to train a puppy to lie down? Dogs use certain postures naturally as ways to signal intent. Puppies are no different. It’s helpful to understand what your puppy’s body language communicates. Dogs communicate as much with body language as they do with whines, barks, or growls. You may have heard of calming signals that dogs use to diffuse tension in themselves and other creatures. 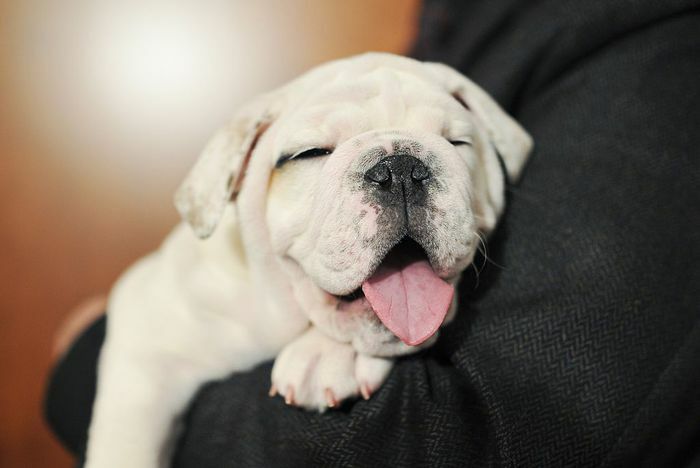 These include yawns, averting their eyes, and licking the nose--and also assuming a “down” position. Lying down not only tells other dogs that he’s no threat but also helps relieve his own stress and tension, relaxes him, and helps him think. In other words, placing your puppy in certain postures can help with his puppy attitude. A dog in a “down” (reclining) position is a calming signal that tells other dogs that he’s calm and means no harm. 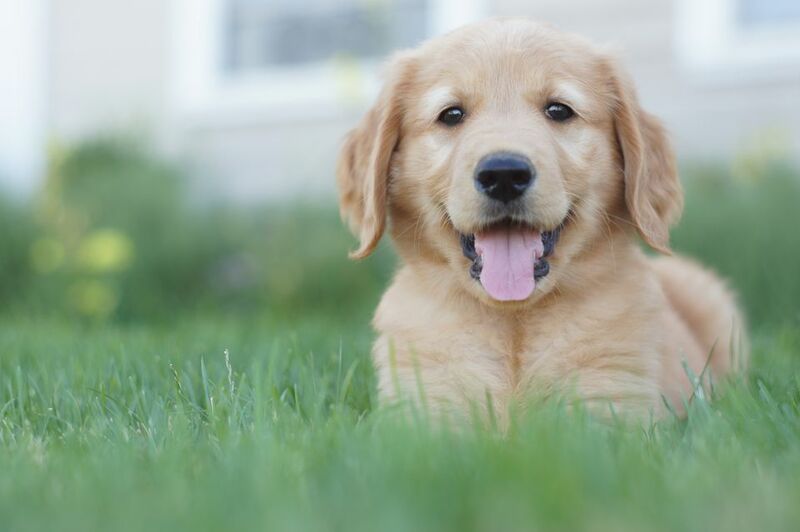 Lying down also helps your puppy to calm himself. It’s a great exercise in relaxation for an overexcited baby dog, and a positive way for you to help your puppy practice self-control. Learning the “down” command keeps the puppy from jumping up on visitors, pestering the cat, or chasing the kids and becoming an unwelcome aggravation. There are a couple of training techniques to teach your puppy to lie down on command. Here’s how to do it using lure training. Show your puppy his training reward of choice. It can be a favorite toy or consist of tiny smidgeons of a strong smelling treat. Remember that he should ONLY get these favorite rewards during training, so he’s more eager to interact. Hold his reward in front of his nose, and lower to the ground and slightly ahead of him, so that he must follow. For tiny pups, you can teach this on an elevated surface like a coffee table, and lower the treat/toy just below table level. You use the reward to lure him into walking his front legs forward until he’s in a down position. Be sure his nose stays in contact with your fingers and treat, all the way down. Once he’s in position, give him the reward. Praise! Practice the command and behavior several times, so he understands the concept. Generally, it’s best to train in several short sessions of 10 minutes or so throughout the day, instead of one long marathon session that wears the pup out. Quit while he’s still interested. You want the puppy to be eager for the next session, and not dread training. It should be fun for you both. Remember that pups learn by making mistakes, so a mistake is just a chance for a do-over. End with success! Praise along with the treat or toy, and throw a puppy party to celebrate how smart he is. After he’s learned to “down” from a sitting position, practice having him “down” from a standing start. With clicker training, the puppy trains himself almost by accident. Basically, the sound of the click signals the puppy that the behavior (in this instance, lying down) is what you want, and you reward the puppy with a treat or toy. When you’ve already taught him to “sit” on command using the clicker, he’ll know to offer you different behaviors to see if he can turn you into a treat machine. Instead of luring, pushing, or positioning the puppy, you wait for him to assume the position on his own. Here’s how. Have treats and clicker ready, and watch your puppy until he assumes the “down” position on his own. Click at the exact moment he goes down, and then reward the behavior with his favorite treat or toy. When this is the pup’s first experience with a clicker, it may take him several minutes to accidentally assume the position again. Repeat the click and reward. Don’t offer any other verbal encouragement or guidance, you want the puppy brain to percolate on its own and process the cause-and-effect of his actions and getting the treat. If the puppy already understands through previous training that the click signals he’s performed what you want, he won’t take nearly as long to repeat the “down” when he connects the dots. Once he’s “got it,” you can begin using the command “down” at the same moment you click. Your pup will very soon associate the action with the word. Add in a hand signal with your verbal “down” command. Choose something that won’t be confused with any other and use that same signal with consistency. For instance, you could hold your hand horizontally (palm down) toward the pup and make a downward sweeping gesture as you say “down.” Click and reward when he complies. Used with consistency your puppy will learn to respond to the verbal and/or silent hand signal command. What a smart baby dog! Once your puppy understands and complies with the “down” command, you’ll have a new tool for controlling those rambunctious puppy moments. That helps him be a polite family member and a welcome guest in other homes. You’ll get all kinds of praise and admiration for being a great trainer of a genius puppy.